If you’re looking for professional, honest and dependable pool table service in and around Denver, Colorado, you’ve come to the right place! At Anytime Billiard Service we’ll give your pool table the attention it deserves. We make the moving of your pool table a breeze. Anytime Billiards offers reputable, friendly pool table services and the finest customer service in the industry, guaranteed! We are the highest quality pool table mechanics in Denver, Colorado. 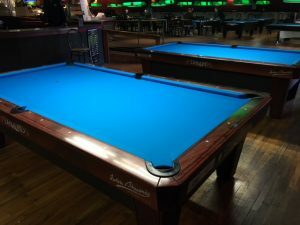 We offer many billiard related services including; moving, recovering your pool table, assembling, recushioning, and refinishing, in Denver, Colorado and all surrounding areas. Do you live in Wyoming or Nebraska and can’t find pool table service? We will travel from Denver to help. We can properly dismantle and crate your pool table to ensure your move is a success. Whether we crate the pool table for your movers, and we may be able to move your pool table for you. Owner has 18 years experience and Anytime Billiard Service has been serving the Denver/Metro area since 2010. We’re proud to put our experience to work for you. The typical pool table consists of basically three pieces of slate, a sturdy frame, strong legs, finished top rails and leather pockets. The design of modern style pool table resulting in more components to assemble. We service all makes and models including but not limited to; Olhausen Pool tables, Diamond Billiard Tables, Connelly Billiards Tables, Brunswick Pool Tables, Golden West billiard tables, Spencer Marston, World of Leisure pool tables, C.L. Bailey pool tables, Draw Knife Log Pool Tables, Beach Billiards, A.E Schmidt pool tables. All of the manufactures listed above build a quality pool table. Call us for any questions regarding you pool table needs. You can also check out azbilliards forum for popular reviews. We are FULLY INSURED, AND GUARANTEE our work. WE TREAT EVERY POOL TABLE AS IF IT WERE OUR OWN! Don’t trust your pool table to just any pool table mechanic.